We’re finally back in action ’round here (well, for the past couple weeks) and done with the massive kitchen overhaul. It’s been so nice having a kitchen sink and range after forty two drawn out days without. But enough about that, it’s time to get back to the important stuff: FOOD! My absolute favorite part of winter — besides the occasional rainy day, which I’ve learned to love in place of snow — is the abundance of citrus. The variety of oranges to choose from is somewhat overwhelming with so many different colors and flavors to choose from, but it allows for an orange salad that pops with flavor instead of just being a boring orange salad whomp, wahhh. I wanted this salad to be layered both visually and in terms of flavors, so I chose three types: navel (orange, classic), cara cara (pink, sweeter) and moro blood (red, tart). But whatever you can get your hands on will work — tangerines, even a grapefruit or pummelo, I think — you can adjust the sweetness by varying the amount of citrus syrup used. And let’s not forget about the kumquats. As someone who can stand the bracing tartness of straight-up lemon wedges, I typically enjoy kumquats unadulterated as a quick snack. However, it seems that most folks find them too pucker-inducing, which is easily remedied by boiling them in simple syrup. As not to waste the kumquat-infused syrup, I combine the strained stuff with a dash of lime to make a fruit salad dressing of sorts: the citrus syrup. While gorgeous and chock full of scurvy-fighting powers, this orange salad is not terribly substancial as a meal of its own. To bulk things up, and continue with the citrus theme, I served it along side butter lettuce and radicchio dressed with creamy avocado dressing (in place of grapefruit juice, I increased the red wine vinegar and used some lime juice) and tossed with avocado cubes and shallot — left out the bacon (gasp!) and grapefruit this time. What do you look forward to most during the winter — food, activity, etc.? In a small saucepan (2-quart) combine sugar and water. Set over medium-high heat and bring to a boil; cook, swirling pan occasionally, until sugar is dissolved. Add in kumquats and boil, stirring occasionally, until sugar syrup is very foamy and kumquats are softened and somewhat translucent (about 4 minutes). Remove pan from heat, remove kumquats from syrup with fork to a plate lined with wax paper (arrange in a single layer). Strain syrup through a fine mesh sieve, set aside. Zest lime using a Microplane or lemon zester (or peel and finely chop), set aside for garnish. Juice lime. Whisk together 1 tablespoon of the strained syrup with 1 1/2 teaspoons (7 grams) lime juice; set aside. With a sharp knife (I love my Global GS-5 for this, and most, tasks, though a paring knife works well, too), cut off both ends, slicing only until you hit the fruit; place on one of its ends so it’s nice and non-rolly (technical term). Following the curve of the fruit, carefully slice off the peel, leaving none (or very little) of the bitter pith behind. (See the first six photos within the instructions here for a pictorial step-by-step.) Cut oranges into 1/4″ thick slices. 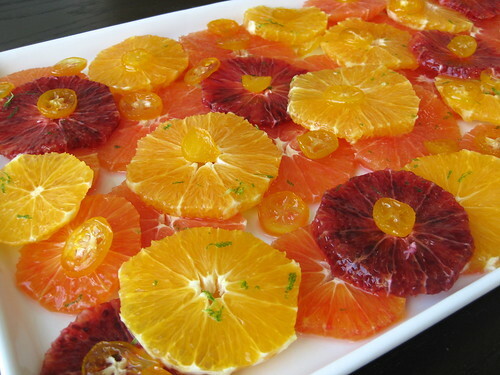 Arrange oranges on a large serving platter. Drizzle with citrus syrup to taste (I used about 1 tablespoon, but it depends on the tartness/sweetness of your oranges), and top with candied kumquats. Garnish with lime zest to taste (1/4 teaspoon or so). 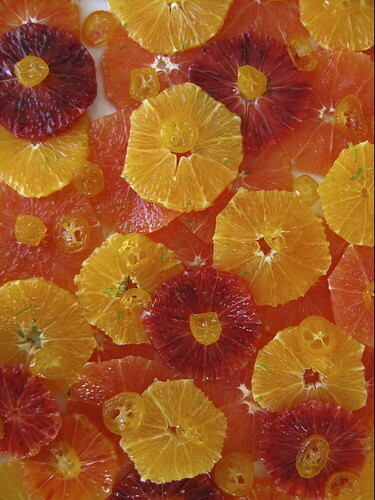 ² I used one pound each Cara Cara (pink), Navel (orange) and Blood Oranges (Red). Try to go for a nice mix of colors and flavors — I think up to a pound of grapefruit (coupled with two pounds of oranges) would also work well.